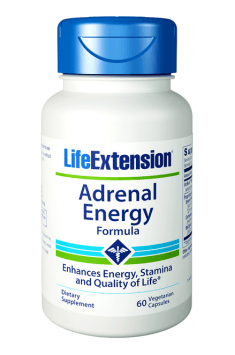 Life Extension Adrenal Energy Formula is a dietary supplement containing the new formula, which aims to alleviate the effects of stress, as well as to increase resistance to stressors. This formulation combines four effective extracts from medicinal plants, ie. Holy Basil, Cordyceps, Brahmi and Ashwagandha, which support the body's homeostasis and the functioning of the adrenal glands, and regulate the hypothalamic-pituitary-adrenal axis (HPA). Holy Basil (Ocimum sanctum; Tulsi) – a medicinal plant used in traditional Chinese and Indian medicine. It contains many biologically active substances, including methyleugenol, eugenol, alpha and beta-caryophyllene, bisabolol, metylochawikol, linalool, 1,8-cineole, and ursolic acid. It exhibits adaptogenic, anxiolytic, antidepressant, immunomodulatory and homeostatic properties. In 2008, there was a clinical study on 35 people who had to assess the effectiveness of the Holy Basil in a generalized anxiety disorder (GAD). Subjects were given 500 mg of extract from the leaves twice a day after meals for a period of two months. The results were evaluated on the basis of a modified Hamilton’s Depression Scale Measurement, which indicated that patients had decreased symptoms of stress and feelings of anxiety. In addition, the subjects showed a better ability to focus and to adapt to changing conditions. The researchers conclude that the mechanism of action of Holy Basil based on the regulation of the HPA axis. Ashwagandha (Withania somnifera) – a medicinal plant used in traditional Eastern medicine, called an Indian ginseng due to its adaptogenic properties. In ayurveda it is regarded as a cure for rheumatism, exhaustion, sexual impotence, and memory impairment. Anxiolytic properties of Ashwagandha was confirmed by a randomized clinical trial of double blind test and placebo-controlled methods in patients suffering from anxiety. The dosage was 500 mg extract withania somnifera per day in two divided doses. Ashwagandha is widely used as a sedative, calming and bringing healthy sleep preparation. It allows the organism to adapt to stress factors, so that it returns to homeostasis, despite the impact of stressors. It restores a dysregulated body to function properly, despite a poor diet, lack of sleep or physical, or mental fatigue. Cordyceps – a species of mushrooms originating in the high mountain areas of Tibet known as Himalayan Viagra due to the properties that increase sexual performance. It is classified as adaptogens, so herbal substances (extracts) supprting the body's resistance to stressors and traumatic experiences, used in states of fatigue or anxiety. It contains many bioactive components including adenosine, cordycepin, vitamins (E, K, B1, B12), phytosterols, flavones, nucleosides, beta-glucans, and several minerals. Bacopa Monnieri (Brahmi) – a medicinal plant commonly used in Indian and ayurveda medicine. It includes a plurality of active substances, including steroidal saponins, and alkaloids. It is recommended for use in children as a tonic for the brain, and because of its ability to stimulate the development of the nervous system. The mechanism of Bakopa’s action is quite broad, difficult to understand, and not completely understood. It is known that active ingredients impact mainly on the limbic system (hippocampus), which is an overriding system, steering the basic mechanisms of behavior. The hippocampus is also heavily involved in the processes of learning and remembering. It was demonstrated that Brahmi increases the number of cells and neural connections in the brain area, thereby improves cognitive and memory, association processes, as well as the reproduction of information. This plant can also be used in neurodegenerative diseases, including Alzheimer's, and Parkinson's disease. In summary, Life Extension Adrenal Energy Formula is a dietary supplement with a broad spectrum of action, designed for anyone who wants to maintain energy and vitality, and also to protect the body against the effects of stress. The product contributes to restoring the systemic balance, and regulates the functioning of the hypothalamic-pituitary-adrenal axis. Dobry produkt , wycisza , uspokaja ale nie otępia . Efekt czuć po tygodniu ale z ziołami tak jest . Adrenal Energy Formula 60 caps. Take 2 capsules, 2 times a day, or ask the doctor. It is recommended to use the product before stressful situations or during the period of increased stress to improve the body's adaptive mechanisms. The ingredients contained in the product have sedative properties so it is recommended to people who have problems with sleep, as well as people who want to support the adrenal glands. Due to the sedative effects it is best taken in the evening.